The ephemeral flesh projects explore, in differing ways, relationships between practices in biological technologies and the physical, ethical and ritual body, through the augmentation of human material in object based form and performance. The living fragments of the human body in these works originate from three distinct sources, each involving their own layering of complexity: my body (through biopsy); a generic human cell line (he_la); and an anonymous living donor. These fragments are estranged from the body, presented in the form of alternative tissue reliquaries - both static and fluid. The significance of bodily materials living outside of, and in addition to, one’s whole body is fundamental to these works. This transfiguration of the body via processes such as tissue culturing, challenge traditional notions of a fixed, bounded human body - conjuring ideas of transgression, rupture, slippage and abstract growth; a space between body and object, natural and artificial, living and (un)dead. These organic forms are often thought of as devoid of life - as if existence is only validated through lived human experience. 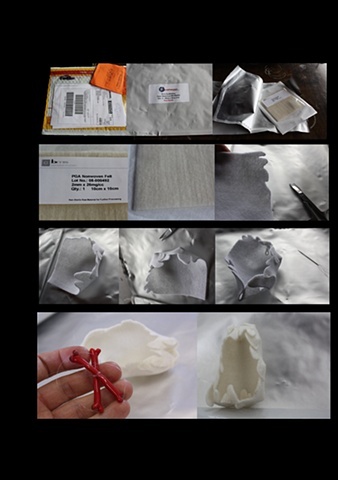 In questioning he relationship between physical body and ‘self’ processes such as tissue culturing also raise ethical issues of value of the body and its materials - whether sacred, psychological, or economical, and the ways in which these materials are controlled and manipulated once outside of the body.